It’s amazing how many times you will find yourself in a situation where you have to change or modify the dates for a file or folder, such as the creation date, last modified date or the last accessed date! I’m not really going to wonder WHY anyone would need to do this, but based on my own experience, I have found it very handy in certain circumstances. Changing the date on a file is actually quite complicated if you try to do it yourself, but thankfully there are a few really nice freeware applications that can get the job done for you quickly and easily. I’m going to quickly go through three different apps each that do pretty much the same thing, but I’d rather mention more than less just in case one does not work for you. NirSoft is probably the great creator of useful freeware utilities and BulkFileChanger is a prime example. It runs on both 32 or 64-bit versions of Windows and is compatible from Windows 2000 to Windows 8. It requires no installation, which is another great benefit. Once you run the program, you’ll recognize their simple GUI interface immediately. To get started, just click File and then Add Files. Go ahead and choose the file or folder you want to change the date/time for. Once it shows up in the list, select it and then click on Actions – Change Time/Attributes. Here you can change the file time manually by checking the boxes you want to modify. There are are options for adding a certain amount of time to the current times or copying one time from another time. Once you have changed the time, click the Do it button and go to Windows Explorer to make sure the time has been changed accordingly. As you can see here, I changed the Date Modified time to one day eariler, making the modified date earlier than the actual Created date/time. Obviously that makes no sense, but there is no check system here, so be careful what you change. If you are going to be changing the date and time for a lot of files/folders on your PC, then you might want to check out Attribute Changer. It’s a shell extension that lets you right-click on a file or folder to perform actions like changing the date/time and lots more. This program has also been recently updated and includes support for Windows XP all the way up to Windows 8. Plus, it supports 64-bit Windows also. Once you install it, go ahead and log off and then log back onto Windows. Now when you right-click on any file or folder, you’ll see a new option called Change Attributes. In the dialog that pops up, you’ll see a bevy of options. It’s all fairly straight-forward with the top being for file properties and the bottom reserved for time stamps. Check the Modify date and time stamps box and you can now change the date and time for Created, Modofied and Accessed for the files/folders. You can also select multiple files/folders and change the attributes for many items at once. What’s even better is that if you click on the Advanced button, you can create a filter to process only certain files out of a larger set. But the best part of this program is the Simulation mode checkbox at the bottom that lets you see exactly what will be changed without actually changing anything. It’s great if you’re going to perform a bulk file update and don’t want to be surprised with the results. It adds an extra bit of safety and security most other programs don’t have. SetFileDate is a bit older since it hasn’t been updated in several years. I would recommend it only for Windows XP. This program has a prettier interface and allows you to multi-select from an explorer type interface rather than having to add files one by one. You can also change the dates of folders using SetFileDate. It’s very small and very easy to use! 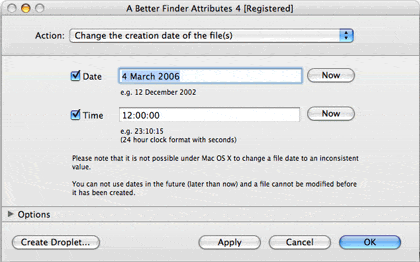 Oh I almost forgot, if you’re a Mac user, you can check out a program called A Better Finder Attributes that will allow you to change the date and time for a file, but it costs around $15! Know of something free, post a comment! Note that if you’re tyring to change file date and times for any kind of nefarious reason, there are ways for forensic experts to figure out that the file was altered. Unless you’re a truly technical geek, there are ways to go into the command line and use obscure NTFS tools to see the history of file date/time changes, so don’t assume that just because Windows explorer shows a new date/time that the original could not be found. If you have any questions, post a comment. Enjoy!